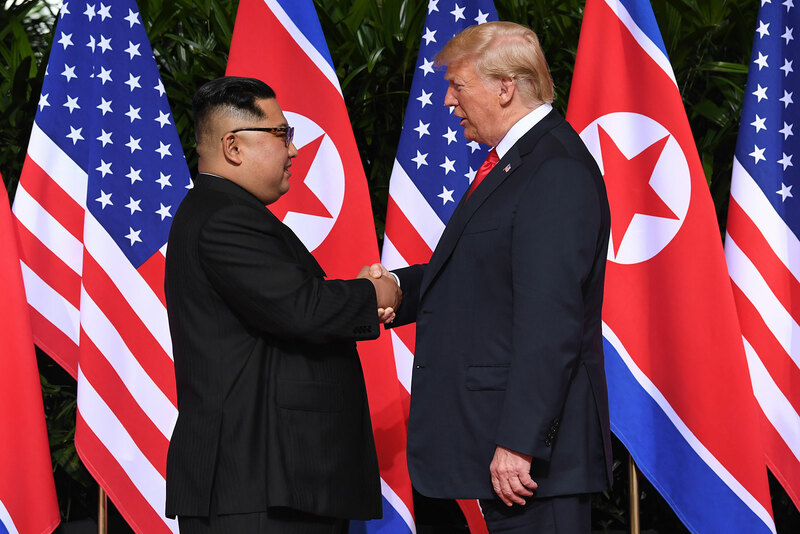 Months after trading insults and threatening each other with nuclear annihilation, US President Donald Trump and North Korean leader Kim Jong Un shook hands Tuesday morning at a historic summit in Singapore. This was the first meeting ever between a sitting US president and a North Korean leader. It came less than two months after Kim met with South Korean President Moon Jae-in. That summit ended with a declaration that the two Koreas — who have been technically at war for almost 70 years now — will sign a peace treaty later this year. At the end of Tuesday’s summit, Kim and Trump signed a document in which they agreed “to work toward complete denuclearization of the Korean Peninsula.” In exchange, Trump agreed to "provide security guarantees" to North Korea. “I think our whole relationship with North Korea and the Korean Peninsula is going to be a very different situation than it has in the past,” said Trump, who added that he’d developed a “special bond” with Kim and would “absolutely” invite him to the White House.